Almost all of the reviewers emphasized the Puma Thunder Spectra’s true to size fit. The sneaker, though a bit cheaper than prevalent fashion dad shoes, was assembled with high-quality materials as described by some. Several buyers were genuinely amazed by the combination of different shapes of materials as well as the brilliant color-blocking. The Puma Thunder Spectra was deemed by many as the best dad shoe of the year because of its very reasonable price in retail. A good number of users loved the comfort that the sneaker delivered. A handful of customers were considering buying another pair due to the extreme satisfaction they received from them. A sneaker expert mentioned that it is relatively lightweight as compared to its clunky facade. Though very popular to collectors, specific colorways of the sneaker are only available in relatively limited quantities which boost its resell price. One appalled user noticed that the toe fabric was too thin for him. From the makers of the Puma Suede comes another Puma Classics iteration that sways well with the current dad shoe fandom. The Puma Thunder Spectra is beautiful shoe considering its rather humongous demeanor which is perfectly portrayed by the considerate color profiling and the perfect mix of material contrast. With a very achievable price range at retail, sneakerheads flock to its initial release hailing it as 2018’s dad shoe of the year. Comfort, quality, and style add to the easily sellable attribute which makes this sneaker a top-notch performer despite being clunky. The resurgence of the so-called “dad shoes” emblazoned a prominent mark in the 2018 sneakerhead pantheon. Though fashion-forward in its appeal, the broad consumer public received its ridiculous portrayal in extremely separate sides of the aesthetic spectrum. But fashion is fashion, and there was never something called lousy publicity especially with these bulky monstrosities which would later be guilty pleasures for bashers. As declared by the experts, the dad sneaker phenomenon did not happen at a proximate date of the release of Balenciaga Triple S and Adidas Wave Runners. Before dwelling more on the roots of the normcore trend, it would be imperative to define first what a dad sneaker is. According to fashion experts, the perfect example of a dad shoe was footwear that someone wears because of its utility and not because of style. With that being said, the pinnacle moment where the ironic craze started was in 2014 via the Adidas Stan Smith. The Stan Smith was the perfect example of a sneaker that was worn because of its comfort and primary function and who else was to sport this brilliant model other than our fathers way back in the 80s to 90s. Simultaneously, businessmen like Steve Jobs would openly support the concept by indulging himself in New Balance sneakers and was even rumored to be the prime influencers of NB’s 900 series. The utility of ugly-looking, clunky shoes continued to hide in the shadows and after some time, gradually faded as the premise of having footwear embraced the lifestyle niche. Sneakers later evolved into a fashion statement that even got a hold of our beloved laidback fathers whose only purpose is to be cozy and comfortable. But thanks to our fathers’ loyalty to their go-to sneaker, eccentric fashion designers in the mid-2010’s decade have something to bring back to the apparel industry. Puma was a bit late on the dad-shoe gimmick considering it was already a global player in sportswear goods. Though it lacked urgency in competing with forerunners on the bulk trend, the German-brand compensated with a reasonable price range. The silhouette being discussed here is the Thunder Spectra by Puma; an answer to the hungry public’s craving for an illogical iteration drenched with all that dad jazz. The Puma Thunder Spectra may be highly mistaken as a rip-off of the Triple S, but this is where Puma outrun Balenciaga. 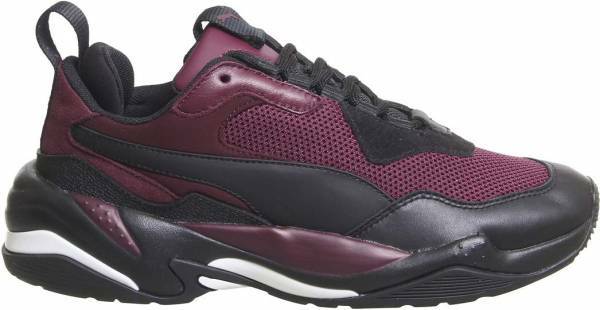 In fact, the accents and the whole idea of the Thunder Spectra were pulled out from the Puma x Alexander McQueen: MCQ Tech Runner Lo. The layering on the Spectra’s upper extending to the midsole was almost a carbon copy of the MCQ Tech Runner Lo along with the color blocking. The Thunder Spectra was released on April 28, 2018, and was the first one to be featured from Puma’s Thunder collection. The sneaker is splashed with adequate hints of red, yellow, blue-green, white, and teal which is ingested by black leather and mesh. The Thunder collection also features two other silhouettes which are the Thunder Desert, and Thunder Electric. The warm reception of the promising dad sneaker gave birth to more colorways in the succeeding months. Debuting one of the first renditions is a Puma Thunder Spectra painted in all black much like that of the Triple Black releases from Nike and other global brands. The August 1 drop features a centerpiece with all its material covered in black; whether its suede, mesh, foam, textile, and whatnot. Crocodile tooling can also be observed on some of its leather elements. By almost reversing the dark-colored underlay of the OG spectra release, Puma reinvents their momentous dad-shoe by introducing summer-ready tints. The Puma Spectra Thunder released in August 2018 called the Color Drizzle colorway mixes playful characters including grey as its base and a dash of orange, yellow, tan, with a little bit of shiny blue accents on the midsole. The low top sneaker sits on top of an almost translucent gum rubber outsole. It seems like the Puma Thunder Spectra decided to experiment with the red chroma as more and more admirers get reeled in with its bandwagon. Splitting the enthusiasts apart are two shades of the color of love mainly with the Burgundy/Black and Pink/Purple. The Burgundy iteration was released earlier in July of 2018 while the lighter red color was introduced after a few months. Collaborating with such a shoe is a privilege for some, and it was best for these fashion boutiques and artists to topple the dad shoe trend with such grace. And yes, it is not only the Spectra who received such glorious revamps but also its siblings as well like the Electric and Desert. Several partnerships expand the Thunder franchise by presenting their own take on what was initially launched Puma Specter. Some of the propitious mergers to come forth were The Shoe Surgeon x Puma Thunder Spectra “Fire and Ice” pack which was publicly introduced on October 19, 2018. The collection tells two new tales of the previously released Burgundy and Color Drizzle colorways which comes hot in sparkly avant-garde style. The Color Drizzle model was reinvented in a flashy, shiny way to resemble a Galena crystal, an ore of lead that is the important source of silver. The Burgundy type, or more technically, the “Garnet” version swaps the original upper with waxed pull-up and Italian leather. Both of these silhouettes enjoy the right amount of wrinkling. The baby boomers or dads per se would lay back with a couple of stretchable trousers coupled with a jacket of the same material while wearing this low top gargantuan. That unspeakable threat of a wardrobe is now long gone and is replaced by the modern flair of loose long-sleeves partnered with slightly fitting joggers or straight cut pants. The number one thing to remember when sporting the Puma Thunder Spectra on feet is to avoid skinny joggers or jeans because it would somehow be out of proportion with the sneaker’s massive tooling. Apparel that flows down to the legs is more advisable to give out a more relaxed vibe which also works with tops as well. The slight color blocking of the Spectra can be complemented by wearing a bit of color in the rest of the outfit to balance things out. Overall, the Puma Thunder Spectra OG colorway utilizes seven different colors scattered all through a black base underlay. This black mesh serves as the canvas for the sneaker’s abstract display of loud colors which includes red, yellow, teal, smoke grey, emerald, and white. The iconic Puma Formstrip is morphed into a matte black stripe surfacing the lateral panels which are generously supported by a soft leather toe cap. The Puma Thunder Spectra comes in a well-supported construction highlighting its lace-up enclosure. The internal lace woven system for lockdown is bolstered by a TPU heel counter which is dipped in semi-translucent grey. To maximize stability, the Thunder Spectra also contains a midfoot backbone positioned under a lightweight IMEVA chunky midsole. Adding more plush tooling and support are glossy emerald overlays on the mid shank and the heel. To top that off, the low top piece of a chunk comes with accommodating pull tabs on the heel and at the tongue. Both of them display Puma brandings with the one on the heel in PUMA print while the tongue loop presents the coveted Jumpcat logo. Users can lace these shoes adequately and utilize it as a slip on afterward. Protective sidewalls add durability to the overall shoe as well as balance and the inner padding resting on the ankles provides a cozy ride. As per the majority of wearers, the Puma Thunder Spectra runs relatively true to size. Copping a half size larger can lead to more wiggle room for the toes. The Puma Thunder Spectra is for sale in a unisex construction following the general pattern for men’s widths. It offers a wide range of sizes starting from 6 to 14. The sneaker showcases a busy look that is masked up by dominant black elements. A red suede overlay found at the bottom of the laces contrasts the black forefoot. A suede patch can also be seen at the heel sporting a blue-green pigment alongside the yellow faux leather overlay wrapping the ankle. A black Puma Formstrip subliminally swipes up from the vamp towards the heel which is opposed by a textured gray heel counter at the bottom of the rear. White and teal accents cover up the midsole in a wave-like scenario. As some of the sneakerheads know, the Thunder franchise is comprised of three silhouettes which are the Puma Thunder Spectra, Electric, and Desert. These different shoes offer different styles to the wearer which makes it easier for others who want to hop in the dad-sneaker bandwagon to choose a model they like. Unfortunately for those that are rookies in this hypebeast scene, specifying which Thunder iteration from another would be mind-boggling. Good thing it is listed down below. In a nutshell, the significant difference between the Thunder Electric and the Spectra are the glossy, metallic details of the former. Sprinkling the Thunder silhouette with sparkly accents was the primary purpose of segregating the two. One of the decisive colorways of the Electric to surface was the silhouette featuring a paint-splattered midsole with gum rubber. Most of the 2018 iterations of the Spectra did not showcase the gum element as its outsole except for the Fall/August release which comes in dominant grey. The Puma Thunder Desert, on the other hand, tones down the Thunder franchise’ loud color tones. Instead of rooting for bold pigments like that of the Spectra, it projects a subdued aura courtesy of pastel-inspired hues and tonal blacks or whites. Moreover, the patches found all over the Desert contains reptilian cues emphasizing its uniqueness among the pack. IMEVA or Injection Molded EVA is utilized for the sneaker’s lightweight midsole cushioning. The laces and the pull tab at the heel are composed of nylon. Aside from the IMEVA, a molded TPU compound blends in with the sneaker’s tooling. A Puma Cat logo can be seen at the tongue which doubles as a pull tab. The uppers consist of mesh, leather, nubuck/suede, TPU, and nylon materials. Colorways include Puma Black, Drizzle/Steel Gray, Rhododendron/Black. The Rhododendron is more like a Burgundy color. Though the teasing of the sneaker generated limited colorways, the Puma Thunder Spectra was known to restock in the subsequent months. The Puma Thunder Spectra in Triple White tonal uppers was released on December 2018.